Chirotables.com is proud to sell Thomas Chiropractic Tables. Thomas Tables feature beautiful hand crafted and custom built equipment by skilled craftsman. Their precision engineering along with the highest quality materials and fine woodworking have made Thomas Tables the clear choice of Chiropractic Practitioners worldwide. The table has a built in foam pad, which replaces the old-fashioned loose table top pad that slips and slides around on the patients. 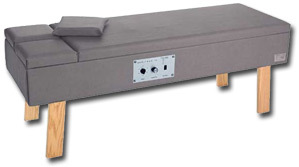 Your patients will relax and feel more comfortable on our extra wide 24-inch table. The table features 8 rollers with variable speed vibration down a 24-inch track to deliver a gentle relaxing massage with a Spring Loaded Carriage that contours the spine. This versatile table is also perfect for exams and therapy! Extra wide 24 inch table for added patient comfort. Adjustable vibration allows for a relaxing or deeply penetrating treatment with one turn of the dial. 30 minute flush mounted timer, lets you be in 2 places at once. Beautiful solid oak legs sets off every rooms décor. The finest-quality naugahyde or cloth to choose from. Matching pillow included. Heavy duty motor guides the 8 rollers up and down a 24 inch track. Spring loaded carriage, will contour to the spine. 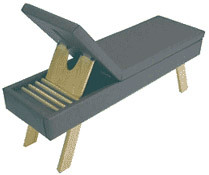 All prices on Chirotables.com for the Thomas Heritage Tables are subject to change without notice. Please call us for up-to-the-minute chiropractic product availability.